Brian O´Connor (ex. VICIUOS RUMORS) on vocals, Ira Black (ex. VICIOUS RUMORS, LIZZY BORDEN, METAL CHURCH) on guitars, plus Fabian Schwarz and Guenter Auschrat, guitars and bass respectively, from THE NEW BLACK, this looks very interesting! Their collective experience can hardly be measured, and there is so much routine. Heavy power-tech-thrash is their game, how good can it be? This is perhaps a little too American for their own good. There is a lot of inventive guitar work, a seriously strong voice and a fine rhythm section consisting of Guenter and drummer Timo Weiss. Fans of OVERKILL will feel at home most of the time, and there is a strong nineties vibe. But far too many songs are merely ok due to a touch of MEGADETH. The attack goes into sleeping mode and the melodies have to stand back for a sterile heaviness at times. The churning riffs are simply too well-used. 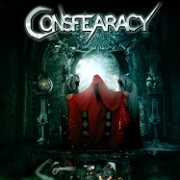 CONSFEARACY may well get it right in the future, but they need more songs like the full-blown hit “Live Again”. US metal with a strong (German?) sense of melody has been far too rare over the years, actually it´s mostly down to the main men´s former employers. Maybe they are scared of becoming copycats? Anyway, all in all a little too wooden this time around, but with a bit of carbon copying this lot has every possibility in the world.